Inside Queen Victoria's saloon, c 1890. 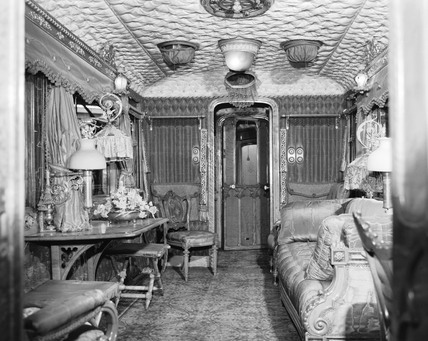 The Royal Train had day and night saloons for the Queen and Prince Albert, as well as carriages for other members of the Royal family and dignitaries. Queen Victoria made her first journey by train in 1842, from Windsor to London. Travelling by train meant that the Queen could move around Britain more easily and could show herself to her people. She could also write and attend to business while she was travelling as train travel was far more comfortable than a stage coach. '100 Years of Progress, 1835-1935', GWR poster, 1935. London & Edinburgh Shipping Company poster, early 20th century. 'Cheshire Lines Railway', Cheshire Lines Railway poster, c 1925. 'To Ireland via Holyhead', LNWR poster, early 20th century. 'Perfection', LNER poster, c 1930s. 'Holiday Excursions - Every Dog Has His Day', GNR poster, 1913. 'The Midland Pullman - the Train of Today', BR poster, c 1960s. Diesel Train near Basenthwaite Lake, BR (LMR) poster, c 1950s.